Imagine a day without water. Water being a necessity, it has many other uses than just quenching our thirst. But careless approaches in wasting water would drain out this much needed resource in the near future. Water and sanitation go hand-in-hand but every person in this world may not have access to water and in the worst case, proper sanitary facilities. Kusum Athukorala was an individual who embarked on a journey in integrated water resource management (IWRM) following one such incident. Crossing disciplinary and academic boundaries from her 12 years of experience as a university teacher in languages and cultural studies to water resources management, she holds an MSc in Managing Rural Change, Imperial College -University of London. 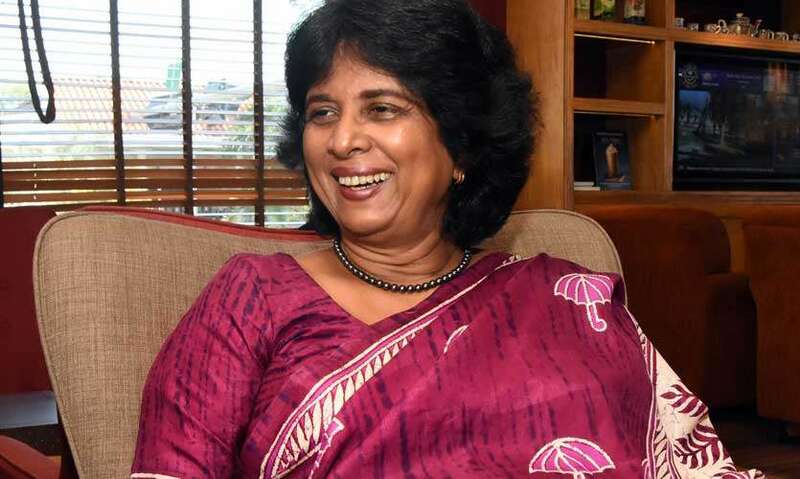 As the founder of Women for Water Partnership and former chair of the Sri Lanka Water Partnership, she is a skilled development professional, who is nationally and internationally recognized for her research and advocacy work in water resource policy, rural development, IWRM, gender and water. Her current advocacy work is in engaging marginalized stakeholders in the Tea Landscape ecosystems in Central Highland catchments. She currently is a member of the National WATSAN committee and the Coastal Conservation Department Advisory Council. She was also the recipient of the International Water Association’s International Women in Water Award. Speaking to W@W, Kusum spoke about her experience in IWRM, status of sanitation in schools and the challenges faced while working in the field. Q : You shifted your career to be actively involved in IWRM. Why did it happen? A : I would call myself a ‘boundary crosser.’ When I came out of university my first job was in the Status of Women survey. But it was a major shift in thinking because it gave me exposure to a world that I have never known. Out of the many firsts, it was also the first time I used a toilet without a door. For me, it was the first time I had to be in such a situation. Then I became curious. Sanitation is a closed subject. Nobody wants to talk or complain about it and nobody is trying to promote a sustainable sanitation culture. Lonely Planet just said that Sri Lanka is the best place to travel but our toilet culture is bad. For example, in Down South we have sanitation apartheid because there are toilets only for foreigners. Q : How important is it to place emphasis on sanitation in schools? A : We pressurise children for not achieving. Sometimes they don’t achieve because they don’t go to school. Girl children don’t go to school because during four days of the month they don’t have access to a proper toilet. There are top schools in Kandy that doesn’t have properly maintained toilets. Therefore if there’s a student with an upset stomach they cannot go to school. This is tying up with our problem of being poor at maintenance. We construct things but do not maintain or have cleansing routines. According to a study that was done, we found that only a very few schools have a proper cleansing system. Through a project done by the Sri Lanka Water Partnership, we provided toilets and rainwater harvesting systems. If you don’t have water in the pipes and if you’re blessed with rains at least eight times of the year, you should make use of it. We also want to make people understand that rainwater is a resource that is never considered. Climate change has two reasons; one is that the dry seasons are getting drier and the extreme events are getting sharper. When the extreme events happen, we need to capture that water. There are students in schools who don’t drink water because they have to use the toilet. Since the conditions of the toilets are bad they don’t want to use them. Therefore they will face long term consequences. We are going to organise a programme in view of ‘World Toilet Day’ in 1700 schools in the Central Province. If we could do one activity based on WTD, people will get an idea and parents will be aware of the status of toilets in their child’s school. Ultimately it is about the child’s health. Q : Let’s talk about the Sri Lanka Water Partnership. A : The Sri Lanka Water Partnership is a body affiliated to the Global Water Partnership and is a network of organisations including state-governed as well private sector departments sitting in its steering committee. We focus on educating the community and therefore have books based on topics such as school sanitation, agriculture, rainwater harvesting written in the national languages. We are people who promote IWRM and have two particular interests; bringing the voices of the community and also include women and youth. We believe that there has to be a women’s voice in relation to decision making when it comes to water. Q : As a female, how difficult was it for you to thrive in this sector? A : When I started off, hardly anybody was involved in this field. Therefore there’s a certain amount of value addition there. Water carrying is seen as women’s job though now men use tractors and bikes for water hauling. My first team in the International Water Management Institute (IWMI) for the gender and irrigation study was the first all-female team to be involved in this sector. We were told that we could not work in irrigation systems due to security issues. But on the contrary, we were able to integrate very well with the community and in the end male farmers trusted us so much that they would even tell us when they were going to steal water. We were able to understand the significant but largely invisible role played by women in irrigated agriculture especially in peak labour periods where they juggled between the homemaker and farmer. With climate change fuelling internal migration there is more feminization of agriculture in many Asian countries, a factor which has to be further studied in SL. But I was promoting gender and irrigation and was talking about it long before all these things started. So the challenge is that you have to walk alone for a long time. Q : How should urban households engage in water management practices? A : Urban households should stop wasting water and get panicked whenever there’s a water cut. They should move into practices such as rainwater and roof water harvesting. It is also important that urban households fix the flip tap which makes it easier for use. We also need to train children to save water so that the message is conveyed at a very young age. Q : The most satisfying part about your career..
A : It takes me to the unseen, beautiful parts of our island and leads me to people who think good about nature. I get to experience the nicest parts of our Sri Lankan culture. Q : Your message to all people in terms of conserving water. A : If we are having a crisis we need to be prepared. Learn the lesson from Cape Town and don’t wait for Day Zero to hit you – the dry seasons are going to be longer and the extreme weather events will be more frequent. After all water is every body’s business.